Sir Richard Branson says he's training to be an astronaut and will take his first trip into space soon. He told BBC Radio 4's You and Yours programme: "We're talking about months away, not years away - so it's close. There are exciting times ahead. "I'm going for astronaut training; I'm going for fitness training, centrifuge and other training, so that my body will hopefully cope well when I go to space. 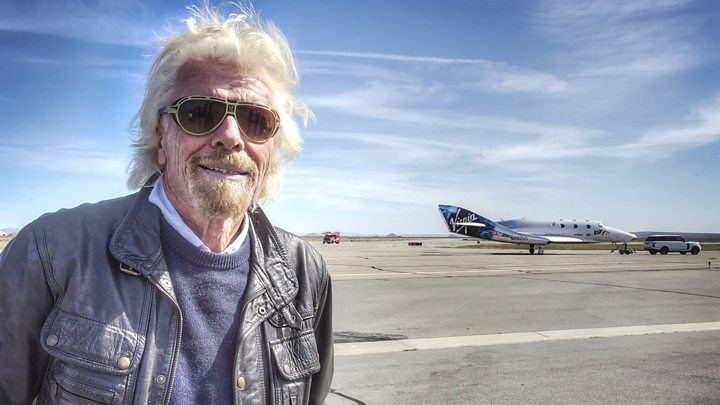 "The 67-year-old multi-millionaire has been investing in commercial space travel since 2004, when he founded space tourism company Virgin Galactic. Sir Richard: "We're talking about months away, not years away"
Sir Richard, tech entrepreneur Elon Musk and Amazon founder Jeff Bezos are now in a race to get fare-paying passengers into space. The British entrepreneur said: "Elon is doing fantastically well getting cargo into space, and he's building bigger and bigger rockets. "But the commercial travel space race is between Branson and Bezos, the UK businessman believes. "I think we're both neck and neck as to who will put people into space first," Sir Richard said. "Ultimately, we have to do it safely. It's more a race with ourselves to make sure we have the craft that are safe to put people up there." Sir Richard hopes to be one of those first space tourists. He said his astronaut training was going well so far, and he has increased his fitness by playing tennis four times a day. "Instead of doing one set of tennis every morning and every evening, I'm doing two sets. I'm going kiting and biking - doing whatever it takes to make me as fit as possible. "The Virgin founder is also taking part in gruelling centrifuge training which recreates the pressures the human body experiences during spaceflight. All astronauts endure G-force training, which simulates the experience of lift-off and travel through the Earth's atmosphere.He added: "If you're going to really enjoy the experience, the fitter you can be the better." Earlier this year, Virgin Galactic completed a supersonic test flight of its SpaceShipTwo passenger rocket ship.It was the first powered flight for the company's new vehicle following the break-up of the previous craft high over the Californian desert.The incident, in 2014, resulted in the death of one pilot and left the other seriously injured.Monday's You and Yours programme is about future transport technology. It broadcasts at 12:15 BST and will then be available on the BBC Radio iPlayer.